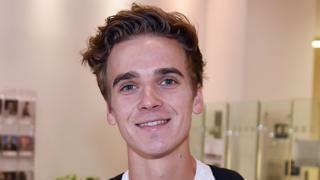 YouTuber Joe Sugg has been unveiled as the latest Strictly contestant. “I don’t really know what I’m doing to be honest,” the 26-year-old vlogger and author said after his identity was revealed on the Radio 1 breakfast show. He becomes the fourth confirmed celebrity after broadcaster Katie Piper, Steps member Faye Tozer and Red Dwarf star Danny John-Jules. Sugg, whose sister is fellow YouTube star Zoella, said he felt “chuffed” to be involved in the show, even if it was “totally out of his comfort zone”. “I know it will be a huge challenge but that’s what life is all about I guess,” he said in a statement. “Funnily enough I’m writing this statement whilst on the way to surprise my grandparents with the news,” he went on. The three other contestants were announced on Monday. Tozer described being on Strictly as “a dream come true” and promised to “relish every moment”. John-Jules said he was “absolutely delighted” at the prospect of performing in “glittery spandex”. The British actor is best-known for playing Cat in the cult-sci-fi comedy. He said he has was looking forward to “getting into something more comfortable” after spending the last few months “on two wheels motorcycling around South America in pink leathers”. His other recognisable roles include the policeman Dwayne Myers in the long-running BBC crime drama Death In Paradise and Barrington in the BBC comedy Maid Marian And Her Merry Men. Tozer, meanwhile, said her participation represents “everything my nine-year-old self ever wanted from showbiz”. The singer, actress and TV presenter rose to fame in 1997 as one of three female co-lead singers in British pop outfit Steps. The group, completed by Lisa Scott-Lee, Ian “H” Watkins, Claire Richards and Lee Latchford-Evans, sold 20 million records worldwide throughout a five-year period. This included three chart-topping albums in the UK as part of 14 consecutive UK top five singles – including two number ones. After Steps disbanded in 2001, Tozer began a theatrical career in 2004 with Andrew Lloyd Webber’s Tell Me On A Sunday before rejoining Steps for their 2011 reunion. Piper appeared on BBC Breakfast on Monday, where it was confirmed she would be taking part in Strictly. She also admitted that when she told her husband about it, “he just thought I was joking”. 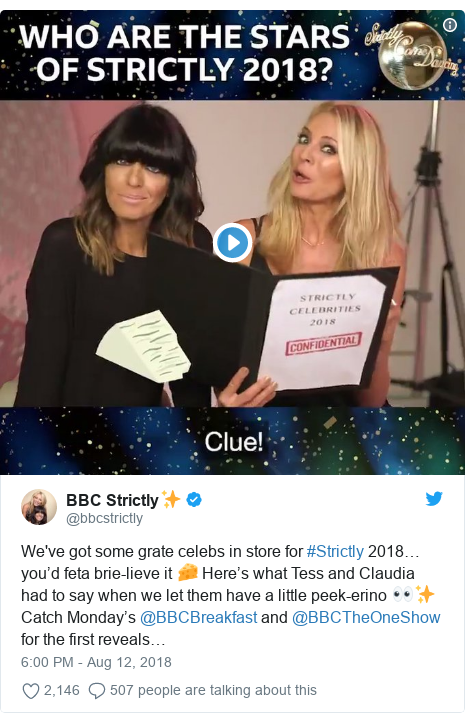 On Sunday, hosts Tess Daly and Claudia Winkleman revealed each of this year’s contestants had been given names of a type of cheese as a codename – to protect their identities in the run-up to the show. Claudia and Tess return with Shirley Ballas heading up the panel of judges again. It will be the first without dancer Brendan Cole, who confirmed he had been axed from the show earlier this year.